Christer Hansson: "Chrysocharis sp., a male"
Thanks... There sure is a lot of variation in the eulophids. I'm planning on submitting my specimens to the USDA SEL eventually, so hopefully I'll be able to get more specific IDs on these at some point. The shortened antennae, dark metallic coloration, and axilla that extend forward past the tegula suggest this group. The shriveled-up abdomen is also a feature of eulophids post-mortem. 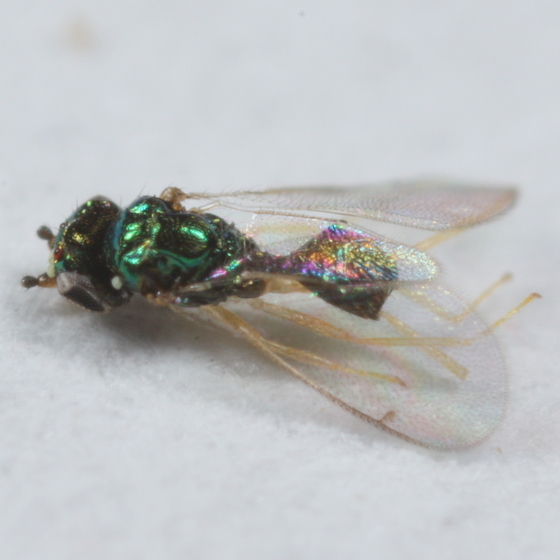 Many are primary parasitoids of leafmining flies, but some are hyperparasitic (my guess in this case) on other hosts such as braconids which you found in the bag. The white objects which appear all over the body including under the abdomen may be some type of fungal spore. There is also a red mite on the head.